The media eye’s new healthcare strategy, and sometimes they miss the point. http://www.vansblog.net The new healthcare law has left all employers looking for ways to comply. Offering a self-insured plan does offer employers a broader array of solutions. The example given in the May 20, 2013 Wall Street Journal article, Employers Eye Bare-Bones Health Plans Under New Law uses extreme examples of the strategy. But there are some industries that have to take that route to remain profitable. Employers that have low income employees are still doing a service to their employees by offering some sort of plan. Something is better than nothing. But it puts the healthcare system back in the same predicament as they are in now; low income workers go to public hospitals for free care. However, there are two points where the article communicates the wrong conclusion. First if an employee has credible healthcare available from their employer they will not qualify for insurance through the Exchange. If their employer offers coverage, there are only two ways for the employee to qualify for coverage from the Exchange. First, is if premium of the employer’s plan is 9.5% or greater than the employee’s income. The language in the law could be a loophole for the Exchanges if the government chooses to exploit it. The regulation reads as 9.5% of household income. If the government wants to prevent the exchanges from imploding by only covering sick people, they could enforce this language. 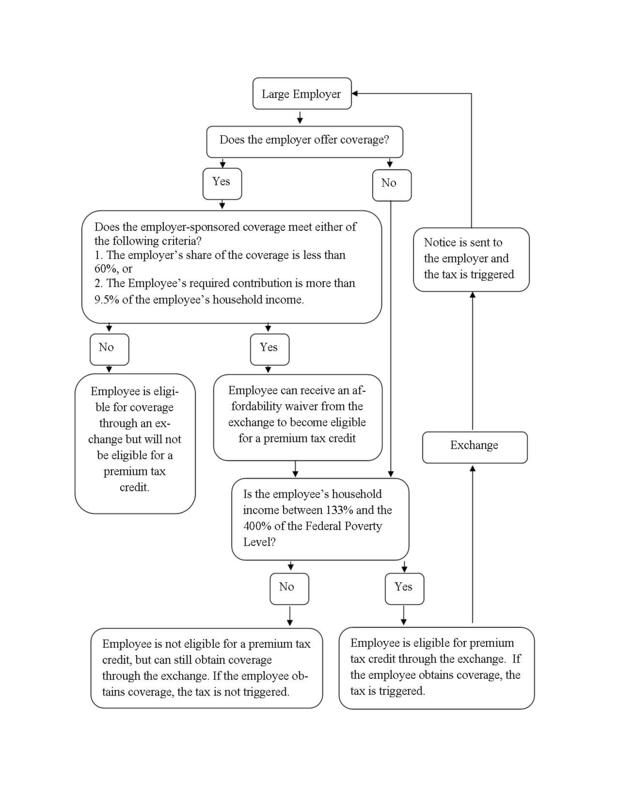 The other way to be denied Exchange coverage is if the employer’s share of the coverage is greater than 60%. If coverage is less than 60% then the employee would qualify for the Exchange. The second point that the article does not communicate correctly is in the Kaiser example. It states that the $9 an hour worker would have to pay as much as $90 per month for a midlevel plan. If the employee picked the low level exchange plan, that might meet the affordability requirement. The Affordable Care Act states that the employer can avoid penalties by offering employee only coverage that meets the two criteria, employee only coverage is less than 9.5% of household income and the employers share of the coverage is greater than 60%. If the employee chooses not to take the coverage then the employer does not pay the penalty. How you explain the Affordable Care Act options to your employees may have a significant effect on your employee retention. Time is ticking down and the deadline for implementation of the most significant parts of the Affordable Care Act is just around the corner. Open enrollment begins on October 1, 2013! This week I’ll discuss the impact of the “pay or play” tax for employers. Please remember that this is just the highlights. On May 8, 2013 the Department of Labor issued temporary guidance and forms that every employer must complete for all employees. At the end of the blog is the link to the sample notices published by the Department of Labor. Here is why the health care options you offer to your employees will affect their desire to work for your company or a competitor. If the plan you choose does not favor your employees, they may get a better tax break by working for an employer that offers a health plan that offers them more premium tax credit. In the context of this blog it is impossible to cover every circumstance that may affect your employee’s choices and the tax benefits available to them. The important thing to take away is that the plan you choose to offer will affect more than just your employee’s health. It may affect your company’s future profitability. The income of your employees. Are they blue-collar, middle management or highly compensated? What is the normal turnover rate of your employees? What portion of the premium will your company pay? Notice for employers with a health care plan. Notice for an employer not offering a health care plan. The Affordable Care Act is an evolving process. When the Affordable Care Act passed Congress it contained about 2700 pages of legislation. The law purposely left a lot of leeway to the Internal Revenue Service, Health and Human Services and the Department of Labor to define the law. The Medical Loss Ratio Regulations (MLR) alone is about 1,000 pages of regulations. As a result many of the reports that you read here or through other media outlets will change. Yes from time to time you may hear reporting that is just wrong. And then at other times you will hear a reporting on the law that has changed because the law has been further refined or changed. A major challenge for companies is complying with all of the required changes and remaining profitable as a business. That is where innovation and creativity come into play. Do you think that it is right if a business or taxpayer takes every legal tax deduction available to them? Under the Affordable Care Act, how do you feel about taking advantage of every legal break you are allowed? Some breaks that are available are outside of box of what has been customary. But an outside of the box strategy may give a business the competitive edge to save money. Here are a few outside of the box strategies to consider. Businesses are required to offer coverage to employees. They are not required to offer coverage to dependents. Depending upon the mix of employees, a business may be able to have a healthcare plan with less risk by not offering dependent coverage. At first, that may seem callus. However companies can avoid the “pay or play” penalty by having employee only coverage. Dependents can go to the SHOP Exchanges operated by the states or federal government for comparable coverage. Less risk may mean lower healthcare cost for the employer. Self-insured plans do not have the same requirements. Setting up a plan that limits or controls the previously listed services may save the employer money. Remember that implementing the requirements of the Affordable Healthcare Act is an evolving process. Much more is yet to come. Some challenges and solutions that you will be faced with will be easy and some may not. Stop back next week for another update. Is your company keeping up with changes to the Affordable Care Act? Is your company keeping up with changes to the Affordable Care Act, i.e. Obamacare? If not here are a few provisions that perhaps you missed. The Affordable Care Act was offering your company money. The Affordable Care Act did provide $5 billion in financial assistance to employers to help them maintain coverage for early retirees age 55 and older who are not yet eligible for Medicare. Did you apply for your assistance? Regretfully that $5 billion dollars is completely obligated so the Early Retiree Reinsurance Program ERRP is no longer accepting applications. If you missed that part of the new healthcare law you are not alone. The Affordable Care Act not only created massive law changes that are extremely difficult to keep up with, but it also creates new professions to help consumers manage the maze of new health plans. With the implementation of the Affordable Care Act is born the profession of the “navigator”. The navigator will be employed by the government health insurance exchange and offer unbiased consumer assistance in selecting a health insurance plan. The health insurance exchanges are primarily for individuals and employers with less than 100 employees. To help larger companies manage the maze of new regulations, private industry is developing the profession of benefit compliance consultant. Obamacare has given the ax to insurance brokers making their profession as obsolete as a switchboard operator. With new regulations insurance companies are prohibited from considering insurance commissions as an expense. So if there is no commission, there is no broker. For now, health insurance exchanges are for smaller companies. Larger companies are forced to manage the multitude of regulations on their own or hire someone who is knowledgeable about the Affordable Care Act to help them navigate the maze. To advise larger employers the financial industry has developed the profession of benefit compliance consultants. Here are a few other developments that are important to know. The Small Business Health Options Program or SHOP Exchanges are the marketplace that small businesses will go to for health coverage in 2014. At the beginning of April, the media reported that the SHOP exchanges will be delayed. THAT IS WRONG. This is the way it was supposed to work. There will be bronze, silver, gold and platinum tier coverage. Bronze is the lower level of coverage progressing up to platinum, the highest level of coverage. Each tier was supposed to have multiple options. The multiple options under each tier will not be available until 2015. That is the only change. The four page summary of benefits of coverage’s or the (SBC) is now in effect. Every plan renewing is supposed to have a four page summary of benefits distributed to employees. That is supposed to be a simplified explanation of the benefits a plan has to offer. My professional opinion is that this provision will have little effect on clearing up the confusion of the plans. The plans are still too complicated and clearly explaining everything on four pages is doubtful. Non-Discrimination testing for insured plans has been pushed back. The IRS is not clear on when that will be implemented. Plans with 200 or more employees were to have automatic enrollment under the Fair Labor and Standards Act (FSLA). The Department of Labor was not clear on when this would be implemented. It may push this back to 2015. Last but far from least is the “pay or play” penalty. Large company plans, those with more than 100 employees will be forced to purchase health insurance on employees or pay a $2,000 per employee penalty beginning in 2014. The Supreme Court ruling on this states clearly that the penalty will not be treated like a tax. The government cannot file criminal charges for non-payment. The government cannot file a lean on property for non-payment of the individual mandate. How the IRS is supposed to collect the penalty is based on taxpayer refunds. In paying the estimated tax, if the taxpayer has overpaid the refund will be reduced by the amount of the penalty. The individual mandate will be taken from the refund. How companies choose to comply with the individual mandate is yet to be seen. For more updates please come back to this blog weekly.